A family owned and operated business involving four generations. 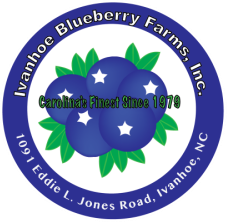 Ivanhoe Blueberry Farms, Inc. is owned and operated by H. Neil Moore and Willie R. Moore, sons of Lorraine O. Moore and the late Harry E. Moore. Neil's daughter, Anna, helps out during her summer breaks from school. Willie's sons, Matthew and Daniel, work in the business with their dad and uncle. Other family members are involved in various aspects of the operation of the business.